African spurred tortoises are popular pets, but require specialized care to maintain their health. In addition to warm temperatures, room to roam and burrow, a proper diet is essential to good health. These tortoises come from an arid environment and are used to foraging on high-fiber grasses so a diet of fruits and vegetables is often too rich for the tortoise and may result in malnutrition. While many of the problems caused by malnutrition occur internally in the liver and kidneys, you will see some external signs on your tortoise. 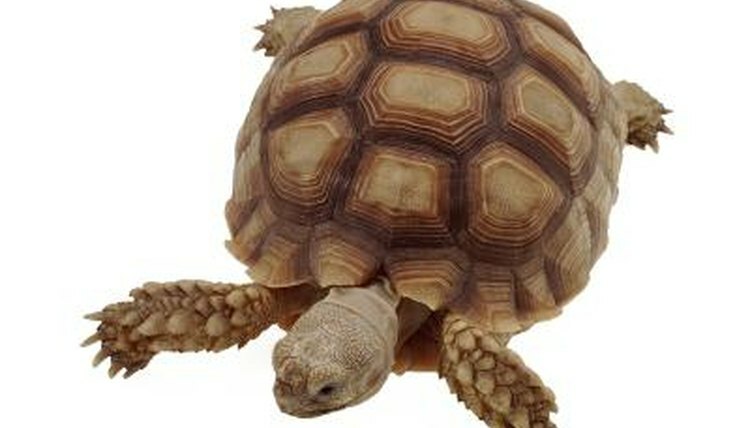 African spurred tortoises should have a hard shell and walk without dragging the lower shell on the ground. A soft shell is a common sign of malnutrition and is usually caused by too little calcium or too much phosphorus in the diet. One possible cause of this imbalance is a diet with too many greens containing large amounts of calcium oxalate. The oxalic acid binds with the calcium causing an imbalance in calcium and phosphorus in the tortoise. Some of these greens include spinach, collards and rhubarb. Pyramiding occurs when keratin builds up in the plate of the tortoise's shell creating a pyramid-like appearance. This is a metabolic bone disease that has several possible causes including too much protein or phosphorus or too little calcium or vitamin D3. Protein and calcium imbalances are the most common causes of pyramiding, but are usually combined with other factors such as lack of exercise, lack of fiber or living in temperatures that are too low. A tortoise with a diet that is too high in vitamin A may have skin folds hanging around its legs and neck. In addition, a healthy African spurred tortoise should have firm stools. If your tortoise has diarrhea, a poor diet is one likely cause. Other potential causes include stress and internal parasites. Approximately 70 percent of an African spurred tortoises diet should come from foraging on grasses and hay. Avoid foods with fat added because they are difficult for African spurred tortoises to digest and may cause liver damage. Also avoid high protein foods including soy, alfalfa and animals as this may cause kidney failure and shell deformity. Vitamin and calcium supplementation may help balance any deficiencies in the tortoises diet. What Are the Signs of Parasites in Bearded Dragons?